WINDCHILL is one of our most exciting entries ever in the Salers Sire Futurity. 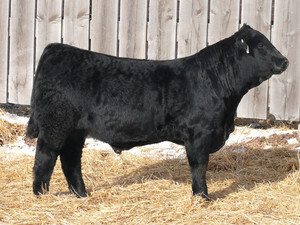 Being sired by NEBRASKA and out of a daughter of MAC BLK LEGEND gives him a pedigree that is unique among Salers genetics. His sire, NEBRASKA, is an ASA Balanced Trait Leader and his dam's sire, LEGEND, is unique among our herdsires in his ability to transmit marbling score to his progeny. This is shown in WINDCHILL's Igenity Profile where he scores an 8 for both marbling and percent choice. WINDCHILL descends from the same cow family as our herdsires BEV Masterpiece and BEV Garrett with has grandmother being a maternal sister to our most famous female, BEV EMMA 262E. This muscular, thick-made, high capacity bull carries a wide array of positive traits in his genetic arsenal, including an outstanding disposition.